December, 8th, 2017, Brisbane: Mahindra & Mahindra Ltd., a part of the US $ 19 billion Mahindra Group, today launched the All New Tougher Next Generation Mahindra Pik Up under its fully-owned subsidiary - Mahindra Automotive Australia Pty Ltd (MAAPL). Mahindra's next Generation PikUp, with its refreshed outer body styling, new six speed transmission, increased turbo diesel power, and stylish new interior is a tough no nonsense ute that is as rugged as ever. Joydeep Moitra, Head of International Operations, Mahindra & Mahindra Ltd., said "We have been here in business for over a decade with a local Mahindra Subsidiary and on-ground team to focus on needs and aspirations of the consumers & to build our offerings. For the new Mahindra PikUp, a six-month test schedule was carried out in Australia and concluded in August 2017, clocking up over 80,000 local kilometres. This input has helped create a Mahindra PikUp perfect for local conditions. This is a testimony of our commitment to developing products for the Australian market." Mahindra products offer, proven reliability, function and premium value for money. The upgrade, with its aggressively-styled exteriors and plush interiors includes a complete overhaul of the Mahindra PikUp's aesthetics, with specific emphasis on the front-end styling. The vehicle comes in two specification levels, S6, which provides function & value and the S10, which offers an SUV-like-specification yet remains within the identity of the Mahindra PikUp's rugged and reliable legacy. The Mahindra PikUp's clean, contemporary lines improve the look of the vehicle while maintaining a tough signature stance. The most compelling changes are to the front of the vehicle where the grille, headlights, bonnet and foglamps have all undergone a substantial redesign. The new grille design is smarter, utilising a glossy black finish with subtle chrome accents (S10 Models), as well as a more prominent Mahindra badge, while the lower air intake has been reshaped to provide a stronger visual integration with the grille. Black mesh inserts are consistently applied to both the main grille and the lower air intake, creating a more consistent appearance. The spacious cabin of the Next Generation PikUp has undergone important upgrades as part of the model line-up. Perhaps the most obvious improvements are to the upholstery and the six-inch (6"), full colour touch screen display on the S10 Double Cab models located in the centre console. 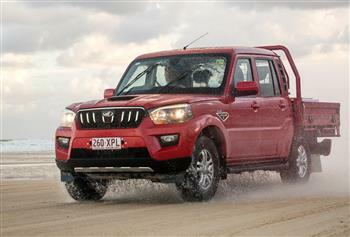 The Mahindra PikUp's cabin is also comprehensively equipped. As the flagship model of the range, the S10 Double Cab benefits from useful features such as remote central locking, cruise control, satellite navigation, reversing camera and a multifunction steering wheel. The upgrade doesn't end here. With smart features like auto wipers and intelligent headlamps the vehicle promises to take the customer experience to the next level of comfort and performance. The turbodiesel engine is linked to a six-speed manual gearbox driving the rear wheels, with 4×4 transmission with low range. The Single Cab PikUp is available in 4x4 S6 Cab Chassis from $26,990 Drive Away. The Dual Cab PikUp is available in 4x4 S6 Cab Chassis from $29,490 Drive Away. The Dual Cab PikUp is available in 4x4 S6 with factory well-side tub from $29,990 Drive Away. The Mahindra Group is a USD 19 billion federation of companies that enables people to rise through innovative mobility solutions, driving rural prosperity, enhancing urban living, nurturing new businesses and fostering communities. It has a leadership position in utility vehicles, information technology, financial services and vacation ownership in India and is the world's largest tractor company, by volume. It also enjoys a strong presence in agribusiness, components, commercial vehicles, consulting services, energy, industrial equipment, logistics, real estate, steel, aerospace, defence and two wheelers. Headquartered in India, Mahindra employs over 200,000 people across 100 countries. 2018 Mahindra Pik Up S10 Dual Cab, cab chassis. Footage of the All New Tougher- Next Generation Mahindra Pik Up.